As a child, I didn't bother to think much about bats, mainly because I didn't see them very much. Just thought they were mice with wings that might attack you. The concept that a bat is a rodent that grew wings and took off into the night sky is way, way off in left field. No, they won't seek to attack you, and many are beneficial by eating insects. They have an extremely advanced echolocation system and flight controls. Proponents of dust-to-dark-knight evolution tell stories about how the bat evolved, but there isn't a shred of evidence for it — old fossil bats are like today's living bats. In addition, the echolocation system and advanced flight control are amazingly complex; everything has to be working together all at the same time, or nothing works at all. 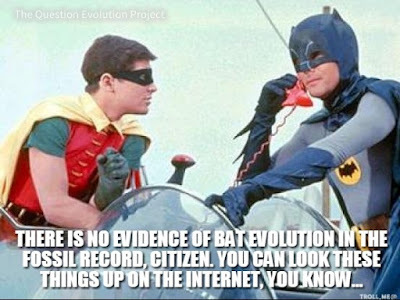 The bat did not evolve, it was created. You don’t just put wings on a naked mole rat and make it fly. Bats are designed to be aero-bat-ic champions. To read what they said and more, click on "Bats Are Home-Run Flyers".